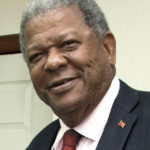 Baldwin Spencer was the third Prime Minister of Antigua and Barbuda from 2004 to 2014. Spencer led the opposition United Progressive Party (UPP) to victory in the March 2004 parliamentary election. In addition to serving as Prime Minister, he became Minister of Foreign Affairs on January 6, 2005. Spencer’s party was swept from power in the June 2014 general election. "It is time for the world, the hemisphere and the region to make sure that relevant institutions of civil society and relevant laws are embedded in the mechanisms of governance."